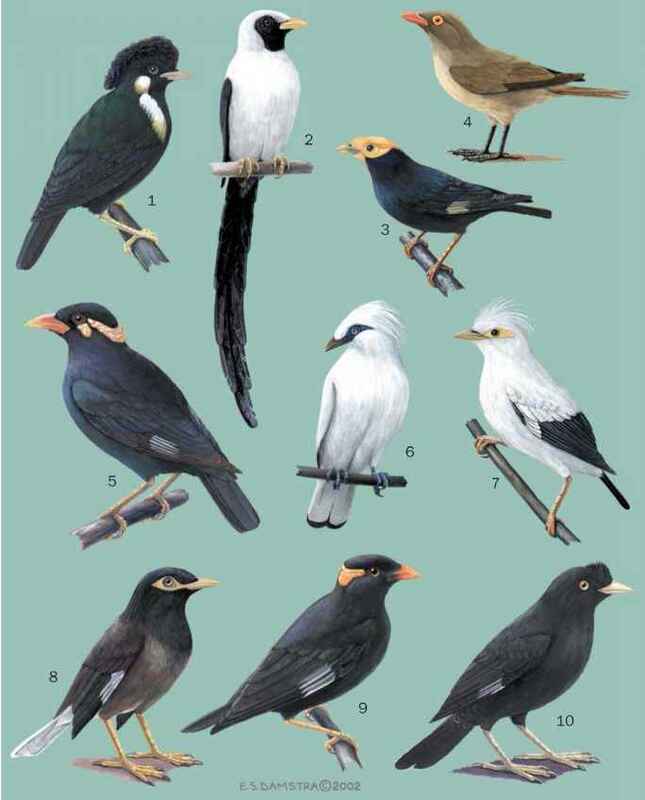 English: Greater crested myna, greater myna, crested myna, Sula myna, king myna, greater king starling, Sula starling; French: Basilorne huppé; German: Helmatzel; Spanish; Estornino Real Grande. 9.4-9.8 in (24-25 cm). Sexes similar; a slightly iridescent black bird with pale yellow bill, large white and buff patches on the side of the neck and breast, and feathers of forehead, crown, and nape pointed inward with central ones longer to form a distinct iridescent purple-black crest. Juveniles have a shorter, duller crest, a brown chin, and a dark upper bill. Banggai east of Sulawesi and the adjacent Sula Islands in the Moluccas. Favors undisturbed forest; also found in disturbed and cultivated areas and in mangroves. Only known to take fruit and berries from canopy to mid-levels of trees.